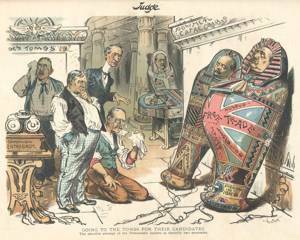 The message of this cartoon is that the 1892 Democratic national ticket is as politically dead as ancient Egyptian mummies, which no amount of electricity from “campaign enthusiasm” can revive. The image is based on Thomas Nast’s famous caricature of Samuel J. Tilden as a mummy (in a sarcophagus), which appeared 15 times in Harper’s Weekly between 1877-1884. The symbol ridiculed the age and political irrelevancy of the former Democratic presidential nominee of 1876, as well as his involvement in that election’s “Cipher Telegrams” scandal.